When I ordered VRICA through Popcracker, I was disappointed because my Googling didn’t turn up any other hits where I could purchase the rest of the issues. 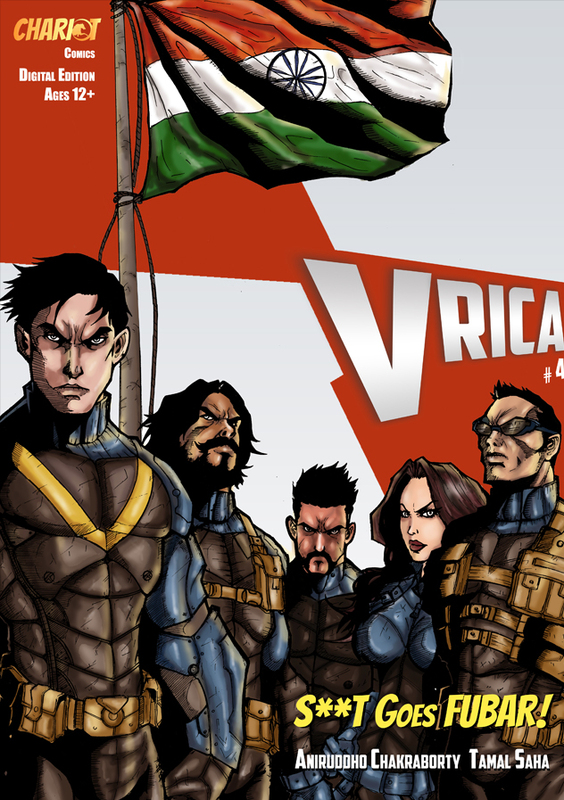 Then I flipped through the first couple of pages of VRICA Issue 2: Burn City Burn and I was floored! I was in for the ride. I instantly started reading Issue 0 in digital format on Readwhere.com and read through all of them in two hours (because I had to explain to my three+ year old Son that huge, burly character “The Reaper” was not as bad as he looked). Hats off! I bow to you all. The references to the Indian Military scene, the characters, the weapons, the politics, the various places through out the series; all point to the birth of “Avengers India Inc”. I just loved that you have given India its first dream team that knows what it is doing and does not hold back on doing what needs to done. Point blank shooting…WOW! Deadly terrorists who don’t care how many die and who are armed with the best weapons possible…yeah! Welcome to the real world and couple that with elements of Sci-Fi that make a couple of the characters all powerful and invincible. The Interrogation, for me, is one of the best dialogues I have seen till date in Indian comics…Marvelous! The fluidic story moves so well from one to another without any gaps and I just love all those “WTF just happened” moments. I have been totally impressed by Team VRICA as it has been well thought of and exquisitely detailed. The honesty, steadfast dedication and faithfulness of every member to their Captain; their character profiles, their flaws and their skill sets, all of it is brilliantly written. Of course, the art work by Tamal Saha and Tarun Kumar Sahu is impeccably brilliant. The colors are well done and lines look gorgeous. All in all, it’s been a glorious ride reading the series and can’t wait to know what happens next. Devang Sanghrajka is a comic book fanatic and works at NVIDIA. He’s from Bangalore. Previous Post Mediocrity Not a Superhero Makes…. Next Post Counterpoint: For the Love of Comics Stop Whining!